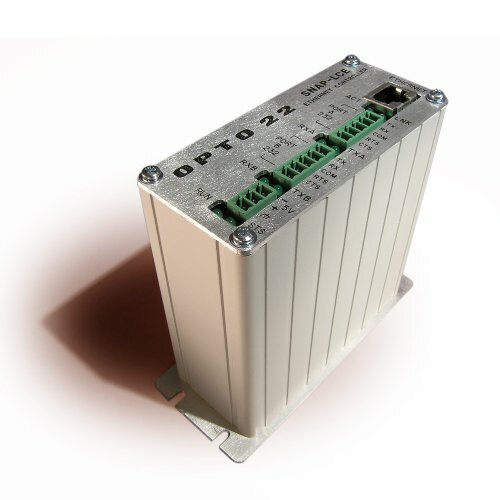 The SNAP-LCE Ethernet-based, stand-alone industrial controller is designed for use with Opto 22s ioControl Basic software, part of the ioProject Basic software suite. Please note that SNAP-LCEs and ioProject are not recommended for new development. The last released version of ioProject Basic is version 7.1. This software will remain available on our website for some time to support customers who have existing SNAP-LCE controllers. For new development, we recommend SNAP-PAC controllers (either standalone or on-the-rack) and PAC Project software. See form #1688, the SNAP PAC System Migration Technical Note, for guidelines on mixing older and newer hardware and software. The SNAP-LCE provides real-time control and communication to SNAP Ethernet-based input/output (I/O) systems and computer networks. Independently running a control program you build with the included ioControl development software, the SNAP-LCE monitors and controls all kinds of devices and equipment. It also communicates data about these devices and equipment directly to Opto 22s ioDisplay and third-party human-machine interfaces (HMIs), to databases, and to other information technology (IT) systems. The controller communicates over standard TCP/IP Ethernet networks at 10 or 100 Mbps. It can be attached to existing wired or wireless Ethernet networks or be used in an independent control network built with standard, off-the-shelf Ethernet hardware. Communication with a SNAP-LCE controller can also be established via a modem connection using Point-to-Point Protocol (PPP), with firmware version 5.1c and newer. Wireless or wireline modem connections are ideal for remote locations where an Ethernet network is not practical. The SNAP-LCE controller includes a 10/100 Mbps Fast Ethernet port for networking through an Ethernet switch to SNAP Simple, SNAP Ethernet, and SNAP Ultimate I/O units, which provide the connections to digital and analog sensors and actuators as well as serial devices.